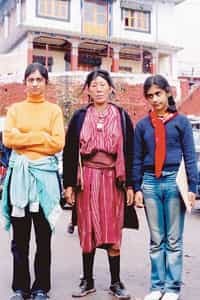 Pampa Chakraborty, 46, director (operations) of Deutsche Technologies, travelled to remote Arunachal Pradesh with her husband, Uday, and daughters— Ujjayanti, 20, and Shreyonti, 13—in May. For the entire family, the two-week holiday was more about connecting with people than merely seeing the sights. You seem to be almost obsessed with Arunachal Pradesh. You could say that. I’ve visited the state a number of times, most recently with my husband and children. Though I am involved with a local NGO working with handloom and handicrafts, these two weeks in May were unadulterated family time with my husband and two daughters—they experienced, first hand, the magic that keeps drawing me back to Arunachal. The West Kameng and Tawang districts are the most picturesque of this beautiful state, so that is where we spent our holiday. Was Kolkata your gateway to the North-East? Though Guwahati offers decent connections, we flew to Tezpur from Kolkata. We had picked up the inner line permits—which are essential for entering the North-Eastern states—from New Delhi. From Tezpur, we drove up to Bhalukpong, with the distinct Assamese landscape of tea gardens, rice fields and small cottages giving way to the mountains of Arunachal, and the journey itself became part of the holiday. The road becomes mountainous from Bhalukpong and hugs the Kameng river for the first 50km, while a lush rainforest covers the lower reaches of the hills. We stopped at a place called Tipi, famous for its Orchidarium, home to some 500 species of orchids, including the carnivorous pitcher plant, which we had only seen in books till then. Further ahead, past hundreds of small and large waterfalls, lies the Sessa Orchid Sanctuary, the only such designated area in the country. It sounds like a beautiful drive. It was, and it wasn’t over, yet. We stopped for lunch at Rupa, a cantonment town, before hitting Bomdila (8,500ft), with its busy main street and two gompas (monasteries). From Bomdila, where we spent the night, the road descends to the picturesque Dirang Valley. A really tortuous climb brought us to the Sela Pass, and yet another descent through the rough mountainscape to Tawang. In parts, the road is sometimes too narrow for two vehicles. This is certainly not a drive for the faint-hearted. What was Tawang all about? At 11,000ft, it’s the last link to civilization, with its modern houses, a thriving bazaar, and satellite communications. Beyond formidable mountain passes lies Tibet. Apart from a couple of other monasteries and a Shanti Stupa, it is home to the Tawang monastery— Mahayana Buddhism’s second biggest monastery after the Potala Palace in Lhasa—which has a magnificent 25ft-tall golden Buddha. The maroon-robed lamas define the town. But the snowy terrain and harsh climate—not to mention the lack of amenities such as heating—mean that only the determined can stay here for an extended period. Night temperatures, even in May, are around 5 degrees Celsius; in the day, it’s a pleasant 18 degrees Celsius. Shreyonti (in orange) and Ujjayanti with Rinchin, a Monpa tribal. So, you descend to the better climate of West Kameng. Right. West Kameng has better equipped hill stations and magnificent lower altitude valleys. 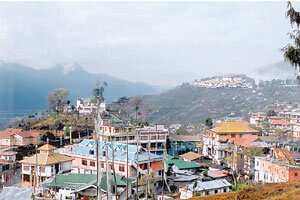 Bomdila has two gompas—the older one is smaller and more authentic, but the more modern one is situated on a hilltop. We spent most of our days with the Monpa workers of the NGO that we helped grow. They are the only North-Eastern community with a long tradition in weaving, mostly Tibetan motifs. But it is Dirang which has a special place in my heart. For one, it is beautiful and the weather, mild. And it’s off the beaten path even for the tourist who ventures into Arunachal. In fact, we call the mountain-top Hotel Prema Ling—it seems to have been modelled after a Swiss chalet—our home base. Dirang town is bisected by a river and has these fabulous mountains dropping down from all sides. It has hanging bridges, a historic Dirang Dzong (stupa), apple and kiwi orchards, even a hot water spring. In winter, I’m often the only stranger here, apart from the black-necked Siberian cranes. Dirang also has an interesting history: It is said that the locals rose against the ruthless rule of the Lhasa monastery and that many lives were lost in the struggle. One upshot of the struggle is that no sale of land is allowed to outsiders. Obviously, Tawang and West Kameng are more than just holiday destinations for you. As travel destinations, I seek out places of great natural beauty— places which allow engagement with locals in ways that change lives. My involvement with the Monpa tribals now extends to my whole family: We collect samples of traditional Monpa-weave dresses, handmade utensils and jewellery, often trekking to far-off villages in the higher reaches. My husband has also extensively photographed the place and the people. We are looking at documenting a culture that is in danger of changing if the proposed airport at Tawang becomes functional. Indian Airlines flies from Kolkata to Tezpur and back on Tuesdays, Wednesdays and Sundays. Current fares start from Rs3,555. You can hire a car from Tezpur to drive into Arunachal Pradesh.